I’d love to introduce you to a truly unique and inspirational shopping site. Novica works alongside National Geographic to give artists around the world a global platform to share their talents. Think of it like a bridge between you and talented artisans across the globe. A place where you can find unique items while changing the lives of others. Novica contacted me about doing a product review and giveaway. I was happy to accept and help spread the word about their site. With the holidays right around the corner, I thought it might be special to choose something new for our Christmas tree, so I chose these holiday ornaments. They arrived BEAUTIFULLY packaged complete with a handwritten note from India. So now I’ve got a dozen of these beauties hanging on my tree and they are so pretty. 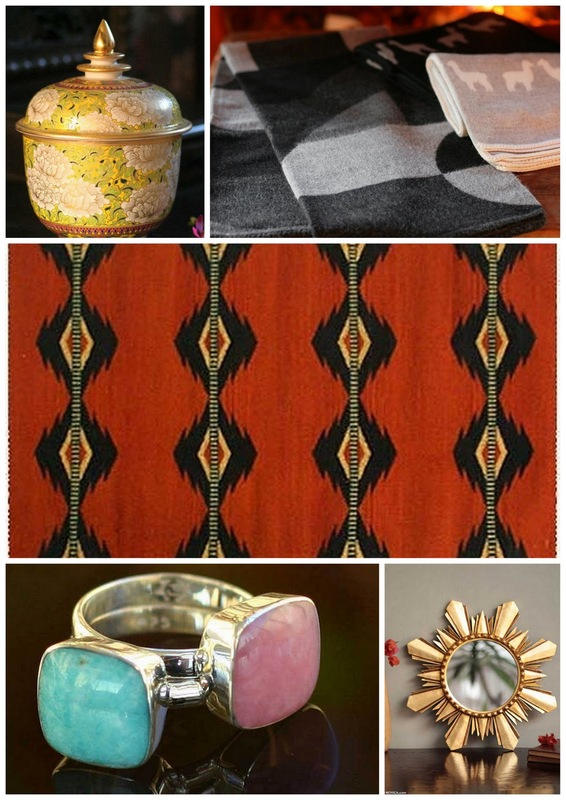 Here are just a few of the other items that tempted my eye! Simply adore those throws! Novica offers a huge selection ranging from all sorts of homegoods, clothing, women’s accessories like scarves, men’s accessories like cufflinks & scarves, jewelry, furniture… you name it. And they want to give one lucky LLL reader a $50 gift card good to Novica’s website. Trust me, you will find something for yourself, or better yet, knock out a holiday gift. 4) Spread the giveaway word on your own FB or twitter page. Giveaway ends Friday night and we’ll announce the winner this weekend. GOOD LUCK!! There are way too many pretty things to just choose one but I am loving the Morena starburst mirror!! It is beautiful!! I am following Novica on twitter!! I want those beautiful ornaments you have!!! 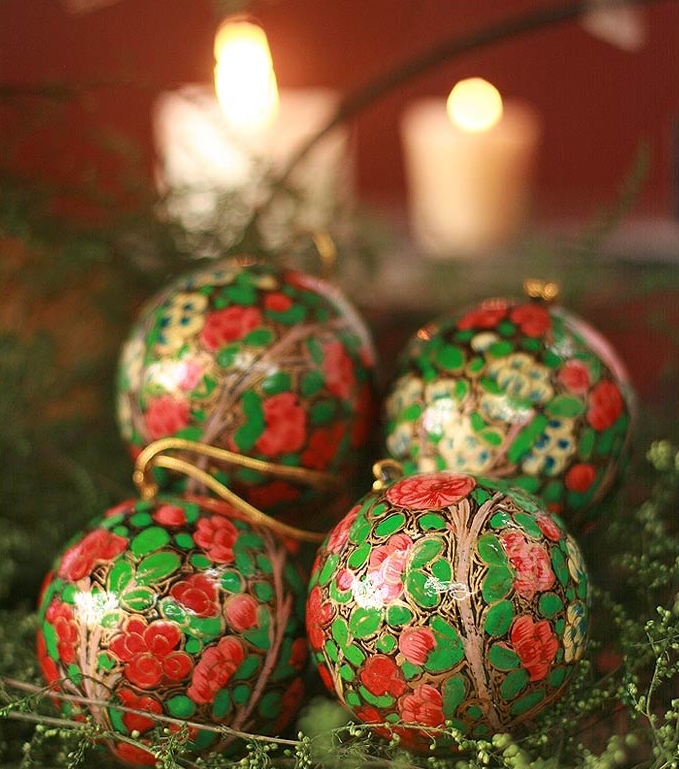 what gorgeous ornaments! I have a fairly naked tree so these would make the perfect addition! Stop by and visit day two of my week of giveaways! added you to my blogroll! And promoted the giveaway on my FB! I love those funky, ‘Dogs Like to Read’ bookends. But your ornaments are gorgeous as well!! I love the Blue topaz and citrine cocktail ring, ‘Chiang Ma’ It’s gorgeous!! Ohhh I like the rings! They have some beautiful paintings so I might choose one of those :) Great giveaway! There is a beautiful scarf there that I’ve had my eye on ! I like the Mango wood box, ‘Black Coffee’! I follow Novica on twitter! I would love to win this for my daughter. Being a grad student her apartment is very sparse and her clothing allowance is very minimal. I could see her choosing something from the decor page to brighten up her apartment. Love those ornaments. Loving the simple ginger jars. It’s hard to pick – so many beautiful items. I love the Sand Dunes and Paracas Coast throws!! I love basically everything at Novica (and even have lots of similar things from my travels!) but I especially love the mahogany and leather chest from the Andes (a region I’ve never been!). I like the Sisal Handbag in Carribean Blue. Lovely giveaway! Mentioned this giveaway (with link) on my FB! I would buy some chandelier earrings! Gorgeous! I just followed them on twitter too! There are so many great items on this site. I love the jewelry, the christmas ornaments, and so many other things…..But, I think with this $50 gift card I would get the Shawl, ‘Maya Unity’. It is a beautiful shawl. I so love the “Andean Kaleidescope” Wool Table Runner! Great stuff! I would get the :Eggshell mosaic bowl, ‘Snow Ball’ (medium)” Love it! I’d buy the bubbles vase from bali!